The Islamic State (Isis) has given an ultimatum to the Christian population living in the Syrian city of Qaryatain to either pay exorbitant taxes, convert to Islam or leave. The Sunni terror group had forced the Syrian forces loyal to President Bashar al-Assad out of the city in August. It captured the strategic town located along a road linking Palmyra with the eastern countryside of Qalamoun, north of Damascus. 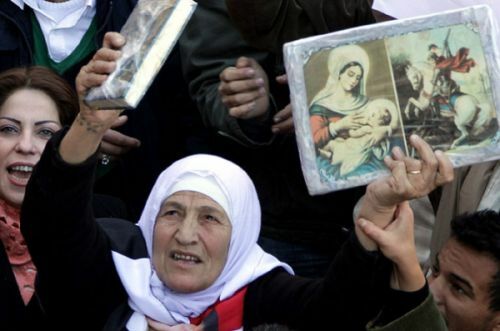 According to the UK-based Syrian Observatory for Human Rights (SOHR), the Christians have been given a 48-hour ultimatum. SOHR noted that most of the Christians are waiting for the Isis to return their identity cards so that they can leave the city. The Isis had recently destroyed the 1,500-year-old Mar Elian Catholic monastery in Qaryatain and threw away the "sacred" remains of the popular saint. The terror group had also kidnapped over 200 Christians, including women and children, in August. There has been no news of them since then. The ISIS terror has causing loss of many lives and the humanity is in danger. Humans of Iraq and Syria feel insecure, no matter what religion they belong to. Recently pictures of Syrians drowning and stranded in sea has captures international media's attention, but it is still of no use. Even the Muslims of the territory are suffering and leaving their hometown. The ISIS is the new terrorist group upsurging in Iraq and Syria, in the name of Islam, which they does not practice at all, killing the humanity and telling the world who is responsible for all this.